Description: Jazz Orchestra of the Concertgebouw, one of the most celebrated big bands in Europe, has featured several Dutch composers by performing and recording their compositions. 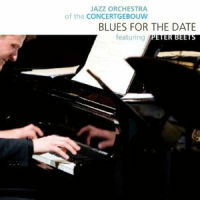 The featured composer of volume three of this "Dutch Series" is Peter Beets who also happens to be an excellent pianist who has thoroughly internalized the vocabularies and styles developed by Bud Powell, Wynton Kelly, Oscar Peterson and McCoy Tyner. His pianistic excellence became known in the US by his trio CDs released by Criss Cross over the years. Seven of Beets' compositions are arranged for the big band by three Dutch arrangers, building on the foundations laid by Quincy Jones in the 1950s and 1960s and adding modern twists. The JOC performed these numbers live in front of an appreciative audience, and the result is this wonderful CD. Beets is featured as soloist in all but one tracks. The music ranges widely from a seamless integration of swing and clave ("It's Happening") to a down-and-dirty blues of the title track. The intricate and effective arrangements are executed crisply by the band, and solos by Beets and other top-notch soloists including reedman Joris Roelofs are awe-inspiring. Strongly recommended to fans of big band jazz and Peter Beets! Recorded live at Bimhuis, Amsderdam on April 5, 2009. The CD package includes a full-length English liner notes by Ted Panken. 5. Is It Wrong To Be Right?